The 90’s were something of a golden age for dance music, with crews including Boogiejuice, Word Of Mouth and Bassquake putting on some legendary parties at the Trades Club and beyond. 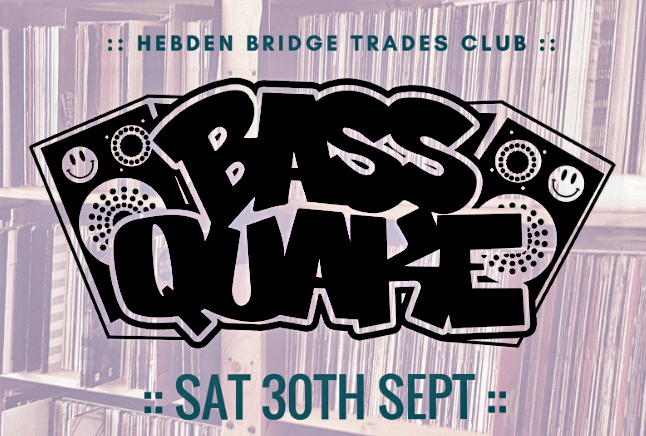 Having reached a quarter of a century since the first Bassquake party at the Trades, we are thrilled to invite you all to a very special one-off event celebrating 90’s dance music culture. The original Bassquake residents will be coming together back where it all began, for the first time in almost two decades. Gavan Fleming, James Deane, Will Oliver & Martin Deane will be your hosts; manning the decks for a journey through their pick of Bassquake classics. We’ll be keeping everything as authentic as possible with an original 90’s lighting rig and we’re hoping to have as many of the original party crew and Hebden diaspora in attendance as possible. Musically speaking, expect all varieties of House, Techno, Acid, Tribal and Progressive House. Dress to sweat.